I’ve had the opportunity to review quite a few training aids during my time as an equipment tester at THP. Some have been very helpful and some haven’t been so great. Many of the training aids I’ve used have had the same drawback: They’re too one dimensional. What I mean is that most of the devices designed to help you improve your golf game only seem to help one specific swing flaw. They might help you focus on that one area, but beyond that they can be somewhat useless. 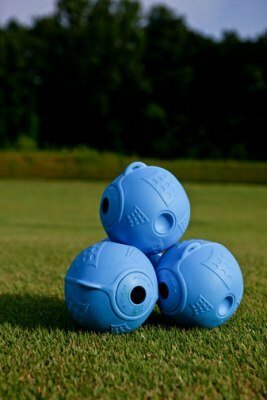 A company called Pipoe Golf thinks they have an answer to that problem. The PIPOE Golf Pro is an all-in-one training aid that can be used in a variety of different manners to help you improve your golf swing. Everything from swing plane to core strengthening techniques are covered with this one device. After doing a little research, I was more than ready to get started with my testing. When the package arrived, I couldn’t believe just how simple looking it was. 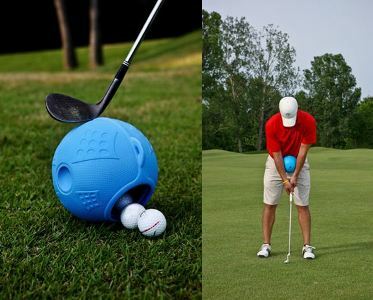 I wondered how something that looked and felt like a hollowed-out Nerf ball could do so many things for my golf game. Included with the PIPOE were several cards that outlined some helpful drills designed for use with the training aid. Based on looks alone, the PIPOE resembles the exercise balls we all see at the gym. Much like those balls, this one can be very effective and versatile. Using the PIPOE Golf Pro is simple. It’s very light weight and extremely versatile, so it can be effective in a wide range of drills. Along with the PIPOE, there are several drill cards with descriptions and pictures of techniques that focus on various components of the golf swing. Beyond the cards, there are also some videos on the company’s website that dive further into the drills by giving explanations and demonstrations. I used the PIPOE Golf Pro at home for some core drills, but also took it to the range with me and used it there. I was impressed with the variety of different methods I could use this seemingly simple ball for. Not only was it quite effective, it was also a lot of fun. Another thing about the PIPOE that I absolutely loved was using it as a shag bag for my practice balls at the short game area. I used the PIPOE Golf Pro in this manner quite a bit and I really liked it. I was able to hang it from my golf bag using its clamp and found it easy to access without getting in my way when I wasn’t using it. As my testing progressed, I couldn’t help comparing the PIPOE Golf Pro to the big blue exercise ball I have at home. It’s amazingly versatile for countless drills and seems like you can find a new method to help you each time you use it. I really like the idea of an all-in-one training aid. Let’s face it. Nobody wants to spend $30 or more on a device only to toss it to the side after it has served its intended purpose. 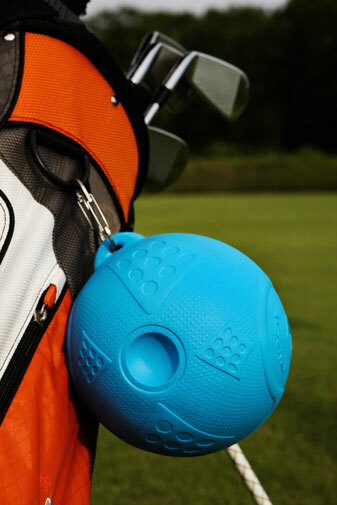 With the PIPOE Golf Pro, golfers have a wide variety of options, which means this training aid will undoubtedly be useful for as long as you own it. The PIPOE Golf Pro is available directly from the company at www.pipoe.com for $39.99 plus shipping. If you’re still on the fence, I encourage you to go to their website and browse the videos and drill cards. I think you’ll be impressed with just how much you can get out of the PIPOE Golf Pro. Great review jake!! Something I’d be interested in for sure. Are they available in any other colors? Also, how do you get the balls out, once you shag them in there. Thanks for the review, Jake! Really liked how you could use it in a variety of ways! Well done! Interesting, curious to see what drills they recommend to perform with this and if they do in fact actually help your golf game. Will check out their website today, thanks for sharing! Great review. Glad to see a company that is coming out with multi dimensional training aids. Thanks for the great review, I like the idea of it’s versatility and that it does what it says it will do. Well done man. Enjoyed the review, Jake. Very interesting. Heading over to their website now to look around. This seems very beneficial. It is certainly versatile for shag bag and drills. I am going to check out the website now. Great review. This seems like an awesome training tool and at a reasonable price. I like that there are alot of different ways to use and different drills also. Versatility is key with training aids and sounds like this is just that. I am going to look more into the different drills to see how this would work for me. I really like that little device. Seems like a fantastic simple training aide that takes up little space and functions on more than one level. Nice writeup Jake! I’m curious what other drills it recommended other than just the ball between the arms drill? Very cool. Love the price point for those many drills as well. Sounds like a versatile training aid. Hmmmm this definitely looks interesting. I think I would use it to keep my arms, shoulders, and upper body connected. Definately interesting, I like some of the “connection type” drills that can done with it. Thanks Jake! Great golf product for under $40. I like that price range. This looks very interesting. Never heard of it, but like the idea of having something small and multi-functional to have in the trunk for my range days. I wish they could be found at the local retailers, I’d like to see it in person. Nice review Jake. Heading to the website now to get some more info. Well done Jake, had no idea there are so many options with just one training aid. Thanks for the info. I’ll check out the website. Cool product. Might just be a good Christmas present. Thanks from everyone at Pipoe! Great review jake, seeing the video helped a lot. I guess I am a little hung up on price.. Solid review Jake!! Very interesting device. And thanks Pipoe for the free shipping offer!!! Happy shopping everyone. Pipoe is 29.99 this weekend only. No coupon needed. Go to Pipoe.com or Amazon.